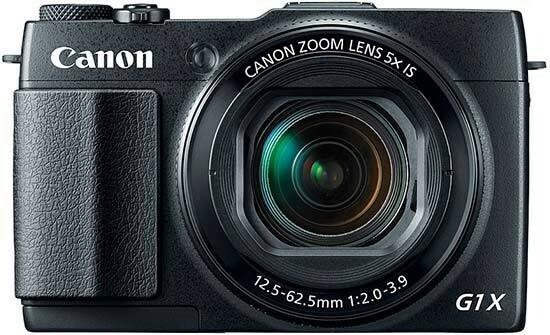 The Canon PowerShot G1 X Mark II is a smaller, lighter and more full-featured update of the original G1 X camera that we enthusiastically reviewed way back in February 2012, with the faster, longer lens, improved AF system, wi-fi/NFC connectivity and dual lens control rings in particular making the upgrade worthwhile. The original camera's exposure compensation dial, vari-angle LCD screen and optical viewfinder have all been removed, though, so it's not all good news, but with its large image sensor, the Canon Powershot G1 X Mark II remains one of the few compact cameras that can deliver almost-DSLR-like levels of control over depth of field. The G1 X Mark II's image quality is excellent for a compact camera thanks to the large sensor that lies at its heart, although we did notice more noise appearing slightly earlier in the ISO range than on the original model. Still, if you've ever wanted DSLR-like pictures from a fixed-lens camera, then look no further than the G1 X Mark II, with its fast f/2-3.9 lens creating very nice bokeh at both ends of the versatile zoom range when shooting wide-open. Sure, it still can't match a DSLR or an APS-C equipped compact system camera at the higher ISO speeds, but ISO 100-1600 is eminently usable with 3200 as a backup, not something that you can say about many compacts. In terms of build quality and handling, the Canon PowerShot G1 X Mark II gets most things right, offering a reassuringly rugged metal chassis and a plethora of customisable controls, including the innovative dual lens control rings, while the tilting touchscreen LCD, folding pop-up flash and 31-point AF system are great features. While we didn't miss the original model's small and murky optical viewfinder, asking £250 / $300 for the optional EVF-DC1 electronic viewfinder may prove to be a stretch too far for most people interested in the already expensive G1 X Mark II. The Canon PowerShot G1 X Mark II tested in this review was kindly provided by CameraWorld, a real camera shop helping you to make the most of your hobby. Our expert team has many years experience within the photographic trade with knowledge gained over 40 years. Many are photographers themselves and enjoy passing their knowledge on. You'll also find our online service fast, efficient and courteous and you can always call us if you want to talk to a human being! We are dedicated to bringing you the very best in service, choice and price. We're very easy to find, our London store is just off Oxford Street between Oxford Circus station and Tottenham Court Road station. The Essex shop is located in High Chelmer Shopping Centre, just off the High Street in Chelmsford. Visit us and you'll always find a friendly welcome. Our policy is to serve our customers as we would like to be served ourselves, a simple ideal that we try hard to live up to.